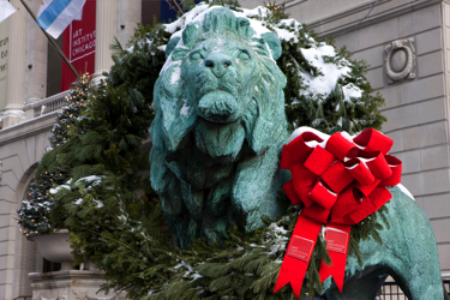 Ring in the holiday season at the Art Institute of Chicago, our city’s historic, world-class, and above all, beloved art museum. The friendly lions that stand guard in front of the museum are now adorned with fragrant evergreen wreaths that evoke the holiday spirit. Pick up a free holiday-themed self guide to the museum, available at all entrances, and be sure to check out the Thorne Miniature Rooms, which are specially decorated for the season. The popular Holly Days Festival will take place Tuesday, December 27 and continue through Friday, December 30. Pop into the Ryan Education Center from 11:00 a.m. to 3:00 p.m for a variety of family workshops and performances. Create a paper animal sculpture, explore movement, rhythm, and yoga at a storytelling led by Pranita Jain of Kalapriya at 11:30 a.m. and 1:00 p.m., or set out on an interactive gallery walk at 1:30 p.m. Art Institute mascot Artie the Lion will make a special appearance on December 27! This entry was posted in Arts/Culture/Entertainment, Family and tagged Art Institute, Christmas in Chicago, holiday fun Chicago. Bookmark the permalink.